A new beginner-level course dedicated to Italian wine and its native grapes will roll out in mid-October in Vancouver, Canada. The Italian Wine Maestro certification course is aimed at wine professionals with some background in the wine trade, albeit without previous specific training in Italian wine; it is also open to wine enthusiasts with an interest in Italian wine culture and its rich grape biodiversity. Michaela Morris during Vinitaly Canada. Morris, wine educator and certified VIA Italian Wine Expert, will be teaching the Italian Wine Maestro pilot course in October. The forthcoming Italian Wine Maestro program was designed by a number of Italian wine experts and professionals directed by Stevie Kim, Managing Director of Vinitaly International and founder of the Vinitaly International Academy (VIA). 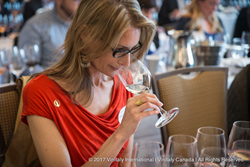 Kim has been working on the program with a number of specialists coordinated by the VIA Scientific Director and award-winning wine writer Ian D’Agata: Michaela Morris, Lingzi He, and Geralyn Brostrom, VIA Italian Wine Experts and experienced wine educators. Morris, Brostrom, and He also devised part of the material that features in the main course book Italian Wine Unplugged Grape by Grape, an easy-to-read reference book on Italian wine recently launched in digital version on Amazon (https://goo.gl/PUm47x). In the text book, the parts dedicated to the Maestro program have been singled out and highlighted, particularly the entries devoted to the most famous Italian grapes as well as the information required to pass the course Maestro examination. Drawing on D’Agata seminal contribution to Italian wine scholarship and education, the Italian Wine Maestro course also follows a grape by grape approach to understanding Italian wine. The pilot program will run in Vancouver in mid-October. It comprises 24 hours of classroom teaching and wine-tasting divided into 8 three-hour sessions to be held on a weekly basis. At the end of the course students will sit a final exam consisting of a test with 50 multiple choice questions and a blind tasting of two wines. The dates and venue are still to be announced and will be communicated on the course webpage (http://www.italianwineunplugged.com/italian-wine-maestro/) in the next couple of weeks. The Italian Wine Maestro is a basic-to-intermediate level program that is geared to trade and enthusiasts and will also prepare candidates who wish to sit the VIA Italian Wine Ambassador program with D’Agata in Verona. Additional information on the pilot Italian Wine Maestro course can be requested at info@italianwineunplugged.com. The Italian Wine Maestro Pilot Program is an entry-level course dedicated to the world of Italian wine and its native grapes. The course (24 hours) is aimed at wine professionals with some background in wine and viticulture, but without any previous specific training in Italian wine. It is also open to wine enthusiasts with an interest in Italian wine culture and its rich grape biodiversity. The course follows a grape by grape approach to understanding Italian wine. After passing a final exam consisting of a multiple-choice test and a bling tasting of two wines, students will receive the Italian Wine Maestro certification. Dedicated to both wine lovers and wine professionals, Italian Wine Unplugged Grape by Grape is a concise yet comprehensive cultural and scientific introduction to Italian wine and its hundreds of native grape varieties. The ebook analyzes over 430 Italian native grape varieties in accessible and easy-to-read entries. It also features color-coded grape variety flash cards and an extensive visual apparatus with mind maps, photographs of grape bunches, maps of Italian wine appellations. Available on Amazon in beta version at the launch price of 9.99 dollars.